Averting the Approaching Apocalypse « Nothing in Biology Makes Sense! This post is a guest contribution by Dr. Levi Morran, NIH postdoctoral fellow at Indiana University. Levi studies the role that both coevolutionary relationships and mating systems play in shaping evolutionary trajectories. His research using experimental coevolution to test the Red Queen hypothesis recently appeared in Science and was featured on NPR and the BBC. I’ll begin by acknowledging that the title of this entry is probably a bit more dramatic than it needs to be. Nonetheless it’s pretty catchy isn’t it? Given that the human population seems to have survived that whole 2012 Mayan calendar thing without incident, I know several of my friends (I won’t name names, but you know I love you) that would immediately think about zombies upon reading this title. However, I am not particularly concerned about the extinction of the human race at the hands of zombies. For one thing, I need more evidence (or in fact any evidence whatsoever) before I buy the whole “zombies will rise up and end us all” fear. Further, Max Brooks (son of Mel Brooks) has given us a hilarious and potentially mildly effective guide to surviving the zombie apocalypse. Ultimately I am far more concerned about bacteria. To avoid inducing mass panic, I’m not talking about a terrified level of concern here, but certainly concerned enough to give it some thought. Why bacteria? Well, the human population is currently in an evolutionary arms race with many of the bacterial species that infect us. We continue to hurl scores of antibiotics at bacterial infections, imposing very strong natural selection, with little regard for the evolution of antibiotic resistance in those bacterial populations. Using current strategies in medicine, we are forced to administer greater doses of drugs or develop novel antibiotics to combat infections as the bacteria evolve greater levels of resistance (Levy and Marshall 2004, Martinez et al. 2007). This is a vicious cycle. I believe it is time to develop new strategies of managing our pathogens and treating infections. Thankfully there are many people that agree and are conducting ground-breaking research in this area, like Andrew Read’s group at Penn State University. A paper by Quan-Guo Zhang and Angus Buckling (2012) takes an experimental evolution approach to begin addressing this issue empirically. In search of a different strategy for curbing the evolution of antibiotic resistance in their experimental populations of the bacterial species Pseudomons flourences, Zhang and Buckling treated their bacterial populations with either antibiotics, a bacteriophage or “phage” (a virus that attacks bacteria), or a combination of the antibiotic and phage. Zhang and Buckling predicted that the combination treatment might be more effective than either antibiotics or phage alone because the combination treatments should better reduce bacterial population sizes and limit their response to selection (Alisky et al. 1998, Chanishvili 2001, Comeau 2007). 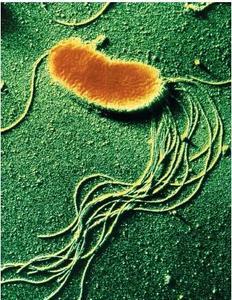 Additionally, bacterial mutations that confer resistance to antibiotics generally do not also confer resistance to phage, so evolution of resistance to the combination treatments would likely require at least two mutations, and thus require more time to evolve resistance than the other treatments (Chanishvili 2001, Kutateladze 2010). Zhang and Buckling evolved their bacterial populations under the 3 different treatments (in addition to a control in which they allowed the bacterial populations to grow under normal conditions) for 24 days. A total of 24 replicate populations were exposed to each treatment. After 24 days of bacterial evolution none of the replicate populations exposed to control conditions or phage went extinct (Figure 1). In contrast, 12 of the replicate populations exposed to only the antibiotic were extinct while 23 of the populations exposed to combination treatment went extinct (Figure 1). Therefore, the combination treatment was the most effective treatment for killing the bacteria. However, that single population that survived the combination treatment could mean trouble. Intense natural selection, like that imposed by the combination treatment, could have produced a super-strain of the bacteria. Zhang and Buckling Modified Figure 1. After 24 days of exposure to different treatments Zhang and Buckling assessed the survival of their bacterial populations. 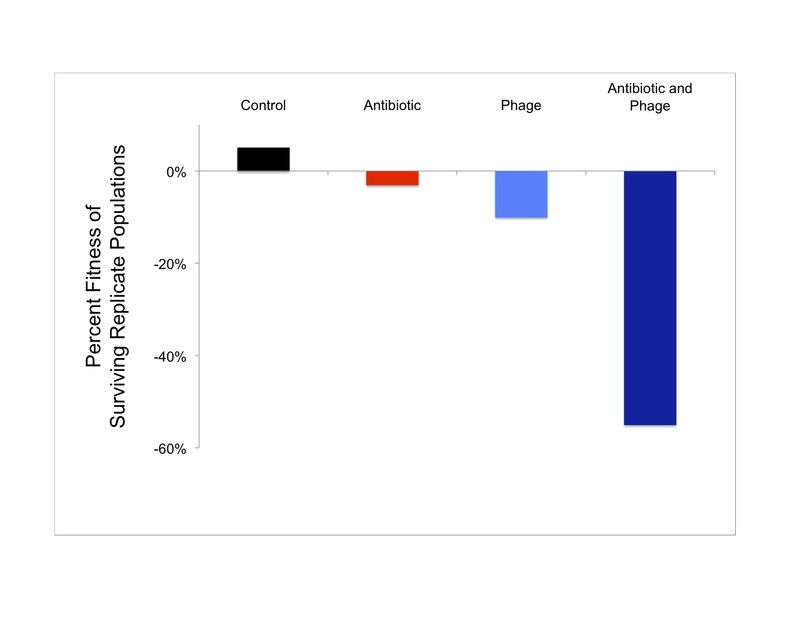 All replicate populations survived the control conditions and exposure to only phage. Half of the populations exposed the antibiotic survived. However, only 1 population out of 24 survived exposure to both antibiotic and phage (Zhang and Buckling 2012). Creation of a super-strain, in this case a strain resistant to both the antibiotic and phage with little cost of maintaining such resistance, would be troubling because the antibiotic-phage combination treatment strategy would have only accelerated the arms race rather than curbing it. However, in many cases the evolution of resistance comes with fitness costs, like significantly reduced growth rates in absence of the antibiotic or phage. These fitness costs are thought to stop the spread of some antibiotic resistant strains simply because the strains cannot successful compete with strains in nature when the antibiotic is not present. Zhang and Buckling tested the fitness of their surviving populations in competition with the ancestral bacterial population that represents the starting point for evolution in this experiment. They found that in a short term loans scenario, only the control bacteria increased in fitness relative to the ancestor when competed under control conditions (Figure 2). More importantly, they observed that the fitness of the single surviving population from the combination treatment was less than half of the ancestor’s fitness in the absence of antibiotic and phage (Figure 2). Therefore, the antibiotic plus phage treatment resulted in the extinction of 23 out of 24 bacterial replicate populations, while the lone surviving population was far from being a super-strain. Zhang and Buckling Modified Figure 2. The ability of the surviving bacterial populations to grow under normal conditions was assessed relative to their ancestral bacterial population. Here, any deviation from 0 is indicative of evolutionary change (a change from the ancestor population). Control populations increased in fitness under normal growth conditions, while populations exposed to either phage or antibiotic exhibited reduced fitness. Most importantly, the population that survived the combined treatment of antibiotic and phage evolved greatly reduced fitness under normal conditions (Zhang and Buckling 2012, seo services). It seems that the combination treatment, or other similar treatments, might prove to be an effective long-term strategy for treating bacterial infections and managing antibiotic resistant bacteria. However, this work is basic research, so there is much more work to be done before combination treatments such as this are implemented as policy. Nonetheless, this work is a step in the right direction to change the dynamics of the evolutionary arms race we find ourselves currently running with our bacterial pathogens. Will changing our approach to treating bacterial infections avert the coming bacterial apocalypse? I’m not sure, but hopefully Max Brooks will write a book about it to make me feel a little bit more prepared. Alisky, J., K. Iczkowski, A. Rapoport, and N. Troitsky. 1998. Bacteriophages show promise as antimicrobial agents. Journal of Infection 36:5–15. Chanishvili, N., T. Chanishvili, M. Tediashvili, and P. A. Barrow. 2001. Phages and their application against drug-resistant bacteria. Journal of Chemical Technology and Biotechnology 76:689–699. Comeau, A. M., F. Tetart, S. N. Trojet, M.-F. Prere, and H. M. Krisch. 2007. Phage-antibiotic synergy (PAS): b-lactam and quinolone antibiotics stimulate virulent phage growth. PLoS ONE 2:e799. Kutateladze, M., and R. Adamia. 2010. Bacteriophages as potential new therapeutics to replace or supplement antibiotics. Trends in biotechnology 28:591–595. Levy, S. B., and B. Marshall. 2004. Antibacterial resistance worldwide: causes, challenges and responses. Nature Medicine 10:S122–S129. Martinez, J. L., F. Baquero, and D. I. Andersson. 2007. Predicting antibiotic resistance. Nature Reviews Microbiology 5:958–965. Zhang, Q.-G., and A. Buckling. 2012. Phages limit the evolution of bacterial antibiotic resistance in experimental microcosms. Evolutionary Applications 5:575–582. This entry was posted in experimental evolution and tagged antibiotic resistance, bacteria, coevolution, open access, Red Queen. This is fascinating research. Antibiotic resistance is terrifying. A former cardiologist of mine didn’t believe it was real or anything dangerous and tried to tell me that because it was a general antibiotic, it wouldn’t do any harm to take it “just in case” (seriously?) despite the AHA’s guidelines. Don’t they teach these things in undergrad microbiology? Good write up of an interesting paper. I”m interested in the molecular genetic basis of the adaptation and the (potential) constraints imposed by available genetic variation to select upon, mutational frequency, pleiotropy, etc. They should sequence the strains from before and after the treatment. How genetically uniform are the strains that they start the experiment with? Do the adaptive mutations seen in the surviving treatments result from fixation of standing or de novo mutations? Do the two treatments affect independent or related genetic regulatory networks in the bacteria? Nice write up. From the applied side, I have a love/hate relationship with experimental evolution papers like this one, for the same reasons that Conor addressed: what would happen to these bacteria in the real world? I think that the real problem we (as humanity) are going to face in the next 50 years is one of massive antibiotic resistance due to overuse in livestock. Unlike this experiment, in livestock the bacteria that have evolved resistance to (for example) more than one type of antibiotic (over several years of administration) will have ample opportunity for beneficial mutations to arise or be received through horizontal gene transfer, increasing fitness.